It’s been more than two decades since its premiere. Does Voyager’s inaugural mission hold up in the 21st century? More than twenty years ago, on January 16th, 1995, Star Trek: Voyager (VOY), the third spin-off from The Original Series (TOS) and the fourth official Star Trek series, premiered. It was a bold move for many reasons. First, it was developed in an effort to create another storyline that continued in the same timeline and universe that The Next Generation (TNG) and Deep Space Nine (DS9) established. Second, Voyager was the literal anchor for a brand new television network, the United Paramount Network or UPN. The mid to late ‘90s would prove to be the heyday for Star Trek as a franchise. 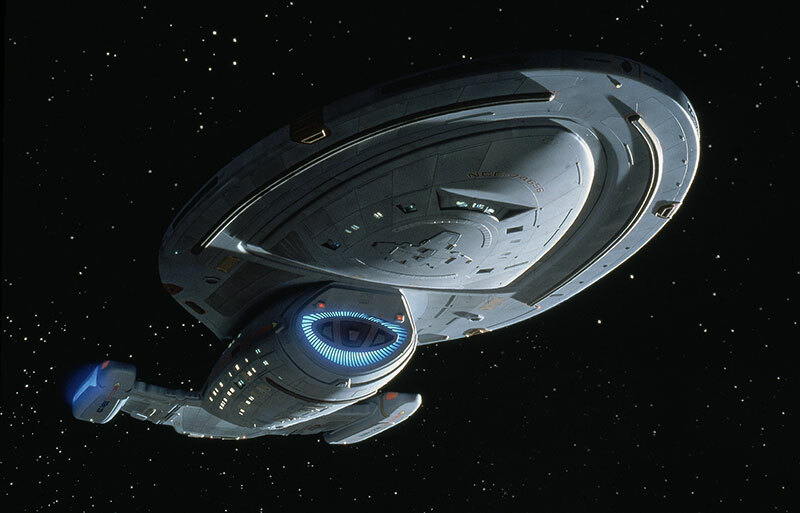 As the heir to such a storied pedigree, Voyager was placed in such a prominent position so as to be the crown jewel of the next wave of Star Trek. Being only 9 at the time, I only vaguely remember the debut of Voyager. I had grown up on The Next Generation, being able to watch it most nights around 7 or 8 pm in syndication. But with Voyager anchoring a new network in primetime, this usually meant it was too late for me to catch it regularly on a school night. I do remember catching a stray episode here and there, especially ones that were particularly noteworthy among my friends. Fan favorite episodes like “Scorpion”, “Equinox”, and “Year of Hell” all come to mind. I even remember watching “Endgame”, the series finale, despite not watching much of Voyager, because my friends had told me just how cool it was to see Voyager with “Batmobile armor” (their words, not mine). But despite this, Voyager still remains the one Trek series I know the least about because it is the one series that I have yet to finish in its entirety. So with the arrival of the show’s 20th anniversary, I thought this would be the perfect opportunity to revisit the series in a comprehensive re-watch, from start to finish, and see if Voyager, at least in its inaugural season, has stood the test of time. First and foremost, Voyager was the first Star Trek series to feature a female starship captain as the lead. There have been other previous portrayals of female starship captains, most notably with the Romulan Commander in the TOS episode “The Enterprise Incident”, as well as Captain Rachel Garrett in TNG’s “Yesterday Enterprise” and the brief appearance of Madge Sinclair as the captain of the USS Saratoga in Star Trek IV: The Voyage Home. But without question, Captain Kathryn Janeway, as played by Kate Mulgrew, would be the most visible and significant of them all. It literally cannot be overstated the cultural and societal impact that Janeway had at the time and continues to have as a female inspiration. 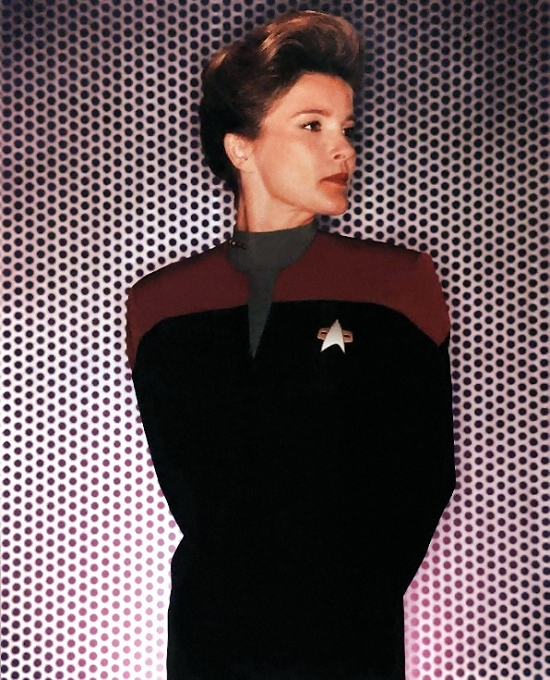 With women still being underrepresented in so many fields, most notably in STEM, having such a visible and confident role model like Janeway was so important, especially in the ’90s and even more so today. We only have to look back to last week to be reminded of this continuing impact when Italian astronaut Samantha Cristoforetti, the first Italian woman in space, snapped a selfie wearing Janeway’s uniform while aboard the International Space Station. And all of this was only made possible because the writers and producers, to their credit, proactively wanted to have greater diversity and representation in Star Trek. 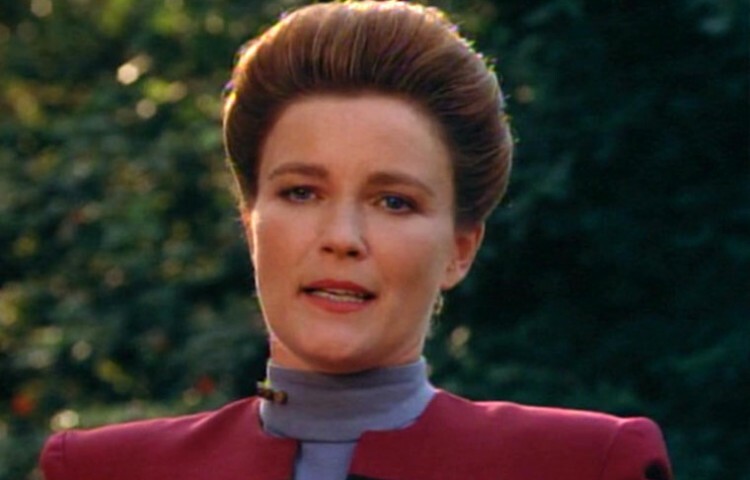 In addition to Janeway setting the tone, the two-part premiere “Caretaker” was also another bold way to start off the series. The premise, that an alien entity has used mysterious and formidable technical means to bring the crew of Voyager 70,000 miles away from home and strand them in the Delta Quadrant, is definitely a captivating hook. The fact that Voyager’s Starfleet crew had to work with disaffected members of the Maquis, whom they were initially trying to capture, adds an even greater sense of intrigue and texture. The entity responsible, known only as the Caretaker, is alien in nature, powerful in ability, but also possesses the potential to be reasoned with, which are all attributes that are in the best tradition of Star Trek storytelling. 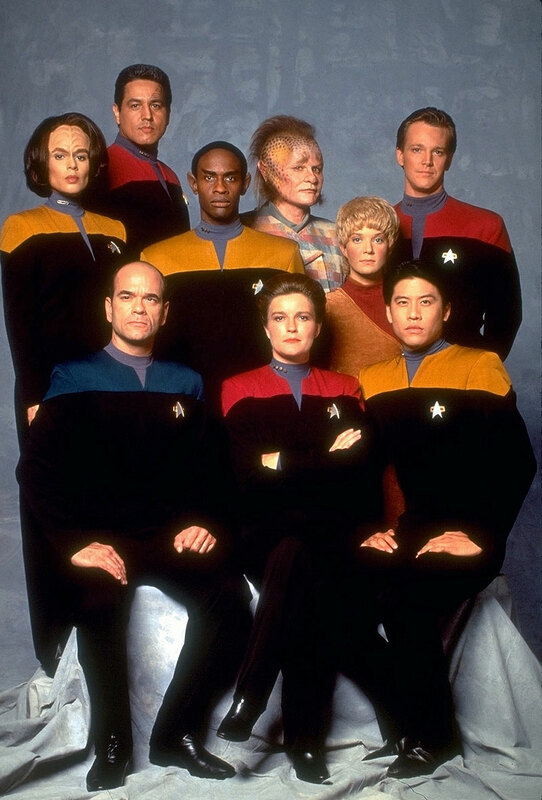 As I progressed past the excellent series premiere, I found that the episodes that most resonated with me were ones that continued and built upon two premises: first, that Voyager had to make difficult decisions on getting back home and second, that a mixed crew of Starfleet and Maquis crewmembers was just a volatile explosion waiting to happen. In my opinion, the episodes that best embodied these story elements were “Eye of the Needle”, “Prime Factors”, “State of Flux”, and “Learning Curve”. 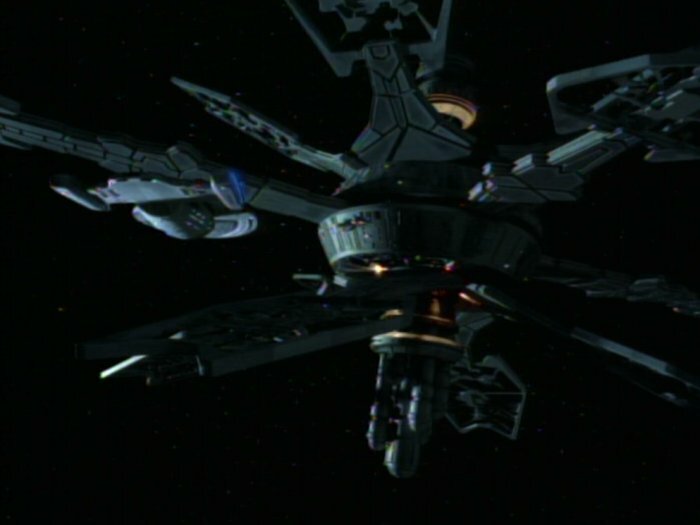 In the “Eye of the Needle”, we have an intriguing story where the Voyager crew appears to have discovered a way home through a wormhole anomaly they discover. 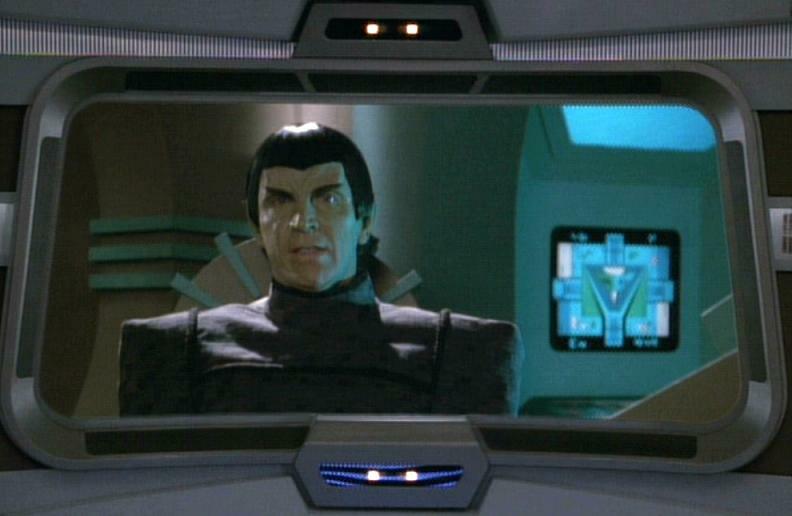 Through this anomaly, they have been able to make contact with a Romulan scientist, Telek R’Mor (played wonderfully by Vaughn Armstrong, later well-known as Admiral Maxwell Forrest in Enterprise) and are able to transport items and even the scientist himself to Voyager. B’Elanna Torres, the chief engineer and former Maquis, speculates that because transport is possible one-way, it is also possible that it works both ways, allowing the entire crew to literally beam out of the Delta Quadrant into the Alpha Quadrant. However, this idea is upended when R’Mor, after transporting aboard Voyager, is asked by Tuvok, the Vulcan security officer, what year it is. When he responds “2351”, the crew realizes that in fact he has been beamed 20 years into the future, into their current time of 2371. The reality then dawns upon Captain Janeway that if they were to beam the entire crew back through this wormhole anomaly, they would in fact be traveling back home, but at the price of doing so 20 years into the past. This type of moral dilemma is the type of storytelling that Star Trek excels at and it is genuinely moving watching Janeway make the gut-wrenching decision that such a price is too high to pay, because of the potential changes to the timeline such an action would precipitate. Instead, they send R’Mor back through the wormhole, forsaking their first real chance at making it back home quickly, and with only a small hope that the messages for their friends and families they asked the scientist to carry back on their behalf, will actually make it to them. This type of moral quandary is further explored in the episode “Prime Factors”. When the crew encounters a race called the Sikarians with technology to potentially cut Voyager’s trip back home in half, if not more, Janeway and indeed her entire crew are faced with another intractable dilemma. The Sikarians have a similar edict that is similar to the Federation’s Prime Directive. They will just not give up their technology to outsiders for fear of future abuse or cultural contamination. Despite her best efforts to forge a compromise that allows Voyager to travel back home while also maintaining this edict, the Sikarians just won’t budge. Torres and fellow Maquis comrade in arms-turned-reluctant Starfleet crewmember Seska both devise a way to potentially exploit the technology without the Sikarians’ or Janeway’s knowledge. Unfortunately, they ultimately discover that the alien technology is not compatible with theirs and their plan goes disastrously awry. 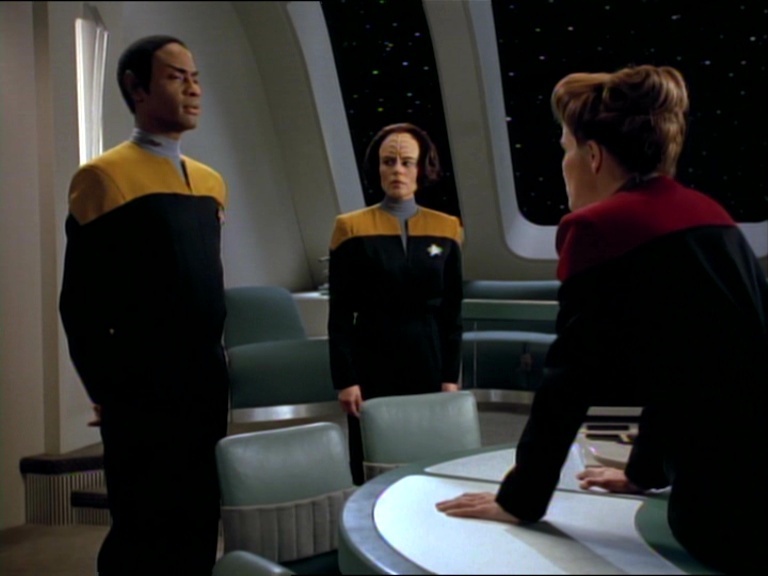 In what is arguably the greatest scene in the episode, it is revealed that Tuvok, someone whom Janeway implicitly trusts, is the one that authorized the attempt to steal the Sikarians’ technology. Kate Mulgrew does a superlative job conveying the sheer level of emotional betrayal she feels because of his actions, while Tim Russ delivers a superb performance demonstrating Tuvok’s restrained Vulcan regret in betraying her, but also highlighting with expert logic why he chose to act in such a fashion. Seska, who played a wonderfully understated yet mildly antagonistic role in “Prime Factors” will fully embrace this role in “State of Flux”. Played wonderfully by Martha Hackett, who also portrayed Subcommander T’Rul in Deep Space Nine’s third season two-parter “The Search”, Seska is revealed to actually be a Cardassian spy who had been surgically altered to look Bajoran in order to infiltrate the Maquis. 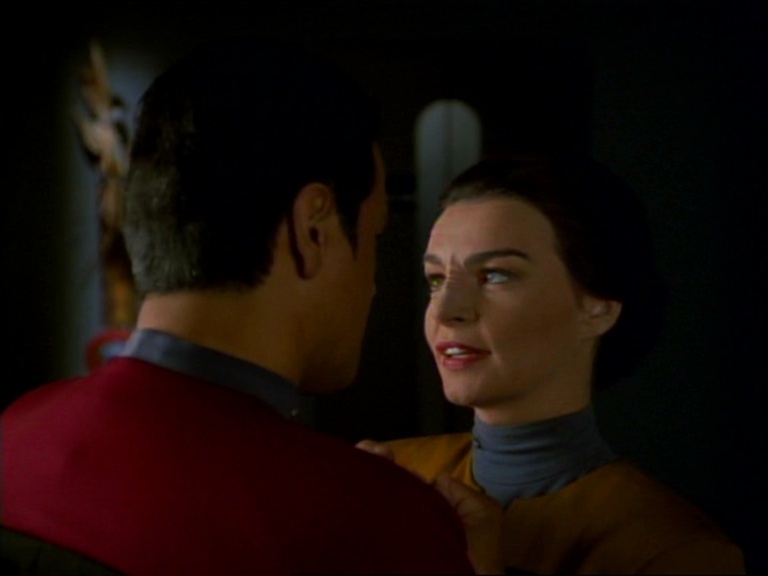 This discovery, in addition to the revelation that she had previously been Chakotay’s lover, adds a surprising amount of tension and nuance in Voyager’s first season. It adds depth to Chakotay in the sense that it shows him to be vulnerable and also intensely loyal, even to a fault. And most importantly, it sends off Seska in a memorable way with her joining up with a race hostile to Voyager, the Kazon. I enjoyed the edge that she brought to the show the moment she was introduced in “Caretaker”, adding a spark of tension that was akin to, but not quite the same as Ro Laren for The Next Generation and Kira Nerys for Deep Space Nine. Although I know that Seska’s character doesn’t survive through the duration of the series, I eagerly anticipate how her storyline will ultimately play out in subsequent seasons. This brings us to the season finale, “Learning Curve”. Although critics, including some of the producers, have lamented that the season ended on “a bottle show” with no cliffhanger or open-ended story threads, I actually enjoyed this episode immensely. First and foremost, it reestablishes the existence of the tension that would undoubtedly exist when Starfleet and Maquis members are forced to work together. It adds a layer of realistic texture to the crew, in the same way that “Lower Decks” (which is one of my all-time favorite Star Trek episodes) did for TNG. And most importantly, it further adds depth to Tuvok, who is forced to adapt to difficult circumstances, after being humbled by being too unyielding and rigid. In the process, the writers are developing a more fleshed out and three-dimensional character for Tuvok, who along with Janeway, B’Elanna Torres, and the ship’s Emergency Medical Hologram or simply “The Doctor”, are rapidly becoming my favorite characters out of the entire cast. Speaking of Torres and the Doctor, they both receive wonderful character development in “Faces” and “Heroes and Demons”, respectively. “Faces” is a revealing look into the two halves of B’Elanna’s persona when she is literally separated into her human and Klingon halves of her personality. “Heroes and Demons” is a delightful TNG-esque adventure featuring the Doctor displaying his nascent heroic and humorous tendencies in a reenactment-gone-wrong of “Beowulf” in the holodeck. I know that the Doctor will go on to play an ever-increasing role in later seasons of Voyager and it is encouraging to see that his substantial development as a fully developed and realized character starts so early here in the first season. However, like with any other iteration of Trek, there are misses as well. 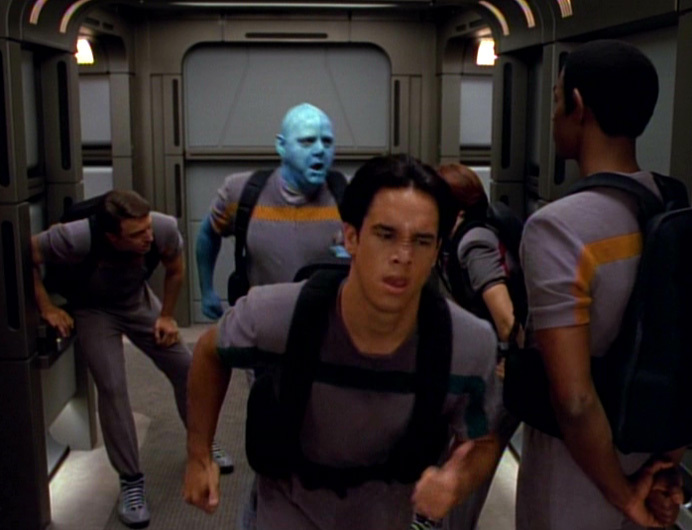 There really does seem to be no justifiable reason why Tom Paris is promoted to Lieutenant over Harry Kim, especially given his previous questionable record of service. Even as a new Voyager watcher, I know about the now age-old joke of “Harry Kim being an ensign forever” and it’s painfully apparent even in the first season just how little regard the writers have for Kim as a character. Episodes such as “Time and Again” and “Ex Post Facto” seem derivative and lacking in narrative energy. The episode “Cathexis” broadly traffics in lazy Native American stereotypes and tropes in a largely failed effort to add depth to Chakotay’s character. And the character of Neelix remains largely undefined, leaving him only to serve as comic relief in most instances. The one notable exception is the episode “Jetrel”. Although the allegory towards weapons of mass destruction is perhaps a bit heavy-handed, Ethan Phillips does a superb job demonstrating his acting range in this episode and hints at the much greater potential that lies for Neelix as a more well-rounded character. I’m looking forward to seeing how his romantic relationship with Kes, another fellow refugee fleeing from the Kazon, as well as an equally underdeveloped character with great potential, develops. What other adventures in the Delta Quadrant await them? I, for one, am eager to find out! *PS – “To The Journey” is also the name of a wonderful and irreverent podcast on Trek.fm dedicated exclusively to all things Voyager. I highly recommend everyone to check it out! 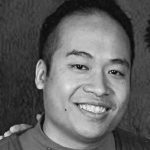 Will Nguyen lives in the Boston area. You can tweet him at @Will_Nguyen. He’s also the co-host for Warp 5, a weekly Enterprise show on Trek.fm, a dedicated podcast network that talks about every aspect of the Trek universe from television, the movies, literature, and everything in between.